Believe it or not you India have a great mix of culture. 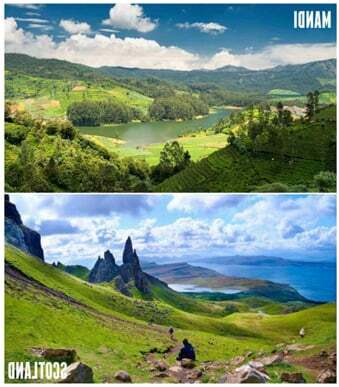 There are many places in India that will make you feel like you are in another country. If you live in India but want to feel as you live or you're visiting and want to feel at home, these 10 places in India may just be what you are looking for. 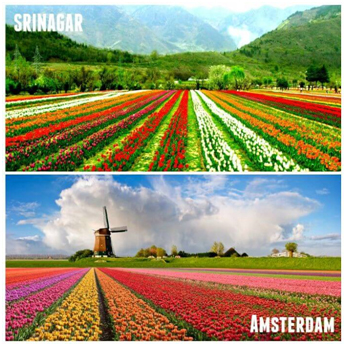 Srinagar, India has the most beautiful fields of tulips. In fact, the fields will make you believe you are in Amsterdam. In Kashmir, India there is a beautiful, peaceful place called Gulmarg. This place will remind you of Switzerland. With the snow covering mountains and the cottages, the view is just breathtaking. Located here is Mandi. Mandi will remind people of the rolling hills of Scotland. Just pure and perfect. If you've ever visited England and fell in love with the Lake Distract, you will love the Nainital in Uttarakhand. 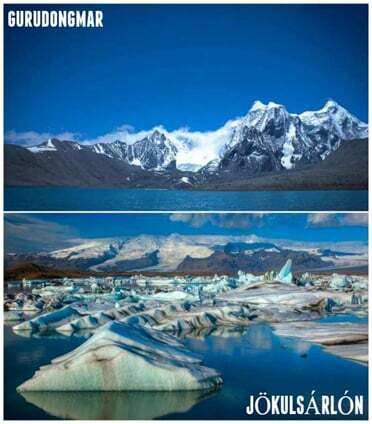 The shapes of the lakes are very similar. Gurudongmar Lake in Sikkim will blow your mind at its beauty. In fact, it has a very similar resemblance to the Jokuularlon Lake in Iceland. The India Gate is located in Delhi, India. 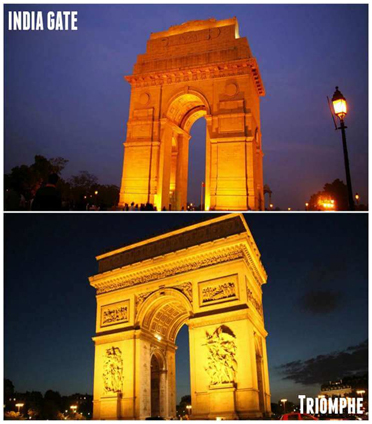 It is also identical to the Arc de Triomphe in France. 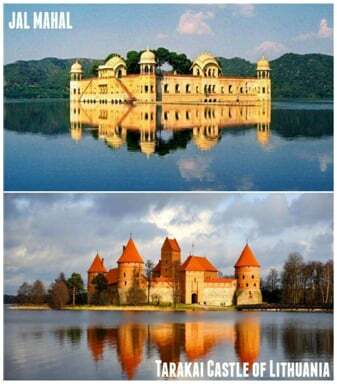 In the middle of the water in Jaipur, India has an outstanding marvelous castle called Jal Mahal. It will remind you of being in Lithuania looking at Trakai Castle. 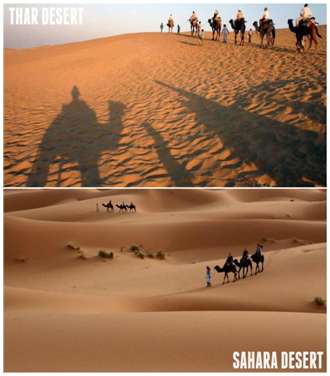 The Thar Desert in Jaisalmer, India not only look similar to the Sahara Desert in Morocco but they also share the same folklore stories. Believe it or not you India have a great mix of culture. 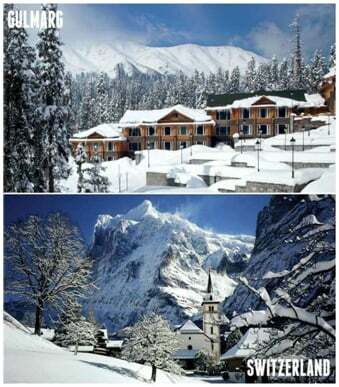 There are many places in India that will make you feel like you are in another country. If you live in India but want to feel as though you live elsewhere or you are visiting and want to feel at home, these 10 places in India may just be what you are looking for. In Kashmir, India there is a beautiful, peaceful place called Gulmarg. This place will remind you of Switzerland. With the snow covering mountains and the cottages, the view is just breathtaking. Located here is Mandi. Mandi will remind people of the rolling hills of Scotland. If you have ever visited England and fell in love with the Lake Distract, you will love the Nainital located in Uttarakhand. 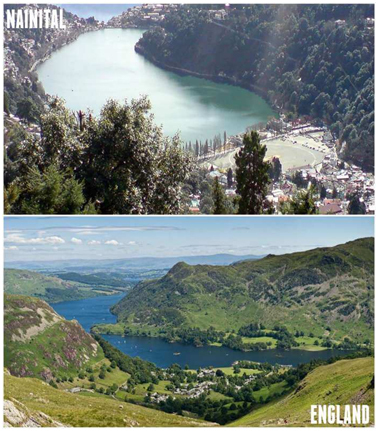 The shapes of the lakes are very similar. 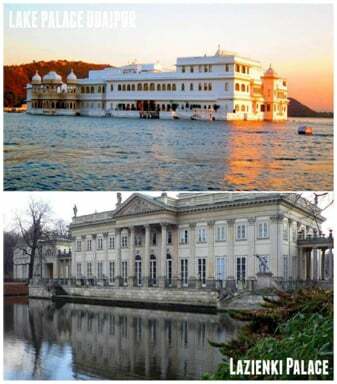 The Lake Palace in Udaipur, India has the same charm as the Lazienki Palace in Poland. They look nothing alike on the outside, but the charm of it is what makes these two so similar. 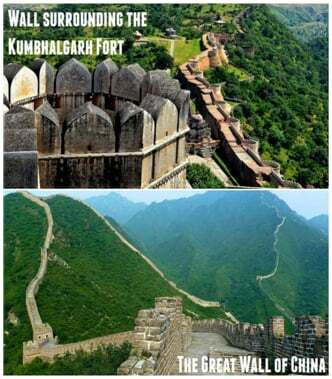 If you love the heritage that goes with the Great Wall of China, then you will love living at Fort of Rajasthan in Kumbhalgarh, India. The culture here is very similar, and the area has a significantly resembles to that of the Great Wall of China. దీపావళికి ముందొచ్చే 'ధనత్రయోదశి' ఎప్పుడో తెలుసా.? 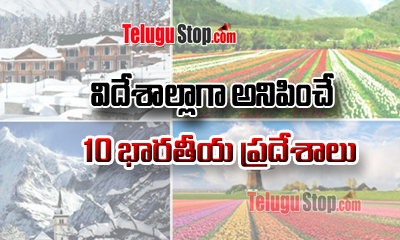 ఆ రోజు ఈ 9 వస్తువుల్లో ఏదో ఒకటి కొంటే ఏమవుతుందంటే. ?